Today, music production and DJing go hand-in-hand. If you’re producing music, DJing is a great way to build your profile and test your tracks out. If you’re DJing, releasing remixes and mashups will set you apart – essential in this competitive industry. This course is perfect for beginners, and self-taught producers and DJs. Whatever genres you’re into, you’ll build a solid foundation of understanding of how to make music with Ableton Live. Under DJ Mark One’s tuition you’ll explore a range of DJ techniques – starting basic, then advancing to 3 and 4 deck mixing. You’ll learn to build your sets to make an impact on CDJs, digital and vinyl platforms. Because if you can make an impact, you’ll be getting asked back. Our world class tutors will teach you how to mix like a pro on CDJs, vinyl and digital. They’ll explain the do’s, the don’ts, DJ branding and how to get gigs. Make the most of unlimited DJ suite access. Music Production: 1x6hr daytime or 2 evening lectures (6 months). Music Composition: Mon or Wed 7pm-10pm (3 months). DJing: Mon or Wed 6-10pm / Sat 2-6pm (4 months). MMS is a Native Instruments Education Partner, a Serato Training Centre, and a Pioneer Authorised Training Centre. Throughout this course and for 6 weeks afterwards you’ll have full, unlimited access to our 3 pro DJ suites. Effects, and when to use them, high and low pass filtering, advanced hot-cue techniques, creative looping, hot cue juggling, off-beat mixing, acapella overlay, 3 and 4 deck mixing. Time to take the first step. You may have a deep desire to make music and play it out. That may be just to your friends, or to a stadium crowd. It all starts with learning the basics, and practice, practice, practice. You’ll be amongst like-minded students who you can collaborate and DJ freely with. Make use of our expert tutors, and a creative environment to inspire you. We have high-end facilities which you have unlimited access to throughout, along with technical support staff who can assist whenever you need extra help. None. Suitable for beginners or self-taught producers. No software, equipment at home or prior qualifications needed. 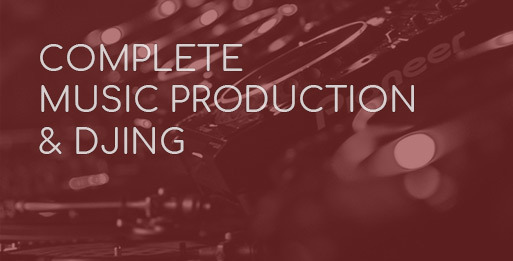 Add the Advanced Music Production to increase your understanding of sound design and mixdown. You’ll be producing music – creating ideas and arranging them into a track – confidently with Ableton Live. You’ll also be able to mix on a range of platforms to club-standard. Contact us for full timetable with regards to Music Composition, Music Production and DJing. from 12 – 48 months, from £83 per month. Practical time is allocated to you (flexible to your schedule) which goes alongside your lectures. We believe access to high-end music production and DJ studios and support from a knowledgeable technical support team is absolutely key in helping you develop to a professional level. Every student has access to their own iMac workstation for music production in the school which contains all the software, samples and plugins that you will use throughout the course. For DJing, we have 7 different DJ setups, so you do not need any decks at home.